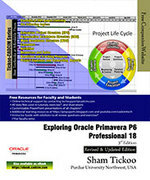 Exploring Oracle Primavera P6 Professional 18 textbook explains the concepts and principles of project management through practical examples, tutorials, and exercises. This enables the users to harness the power of managing projects with Oracle Primavera P6 for their specific use. In this textbook, the author emphasizes on planning, managing and controlling the projects, assigning resources and roles to a project, and producing schedule and resources reports and graphics. This textbook is specially meant for professionals and students in engineering, project management and allied fields in the building industry. Detailed explanation of Oracle Primavera concepts. Real-world projects given as tutorials. Tips and Notes throughout the textbook. 264 pages of illustrated text. Self-Evaluation Tests, Review Questions, and Exercises at the end of the chapters.